The Extended Gyrocopter Experience is a flying lesson around the beautifully North Yorkshire countryside in a Gyrocopter which lasts for about an hour. Before the flight there will be a short introduction to Gyrocopters and a safety briefing. The trainee pilot will have the opportunity to have all their questions answered and they will be given an introduction to how they fly. Both the briefing session and flight will be done one-to-one with a Flying Instructor. During their flight, our trainee pilots will have the opportunity to take the controls and learn the basics of flying this exciting aircraft. The Gyrocopter is dual controlled and the Instructor will be able to take control at any time. For those living nearby it is a truly fantastic experience to see their local area from the sky and wave at their neighbours. It might be possible to fly close to their house (see details below to see if this is possible) or around famous landmarks like Castle Howard or possibly along a river venturing further away from York. The extended period in the air allows our trainee pilots to get a real feel for the controls of the Gyrocopter and if desired, they could be flying for the majority of the flight. You can choose where to fly, generally within the oval shown on the map subject to rules of the air and air traffic control clearance. We cannot fly over built-up areas or lower than 500 feet. Some areas of the sky are restricted by the military. 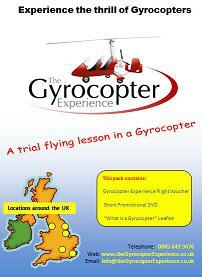 The gift pack includes a voucher for a 60 minute flight in a Gyrocopter. Also in the pack is a short promotional DVD which illustrates the excitement of flying in a Gyrocopter, together with a leaflet answering most of the basic questions people ask. Purchasing a gift pack gives you something to wrap up and give to the lucky recipient on their special day allowing them to see for themselves what they will experience. You book the date & time for your flight at your convenience. The York Gyrocopter Experience is a flying lesson in a Gyrocopter around York which lasts around 30 minutes. Before the flight there will be a short introduction to Gyrocopters and a safety briefing. The introduction may be done as part of a group of like-minded people, whilst lessons are always flown one-to-one with a Flying Instructor. During their flight, our trainee pilots will sit in the pilot`s seat in the front of the Gyrocopter and will have an unrestricted view. The Instructor will sit in the rear seat. Following, take-off student pilots will be at the outskirts of the city and will be able to see the Minster. Skirting around the racecourse, overhead Naburn marina, down the river Ouse and over flying McArthur Glen Outlet Mall there will be a clear view of many York Landmarks. After some hands-on control as Elvington airfield comes into view and they pass over the Monks Cross centre, the Instructor will demonstrate some of the unique flying abilities of a Gyrocopter. Returning to the airfield will provide an opportunity to experience first-hand the gilding capabilities of the Gyrocopter, touching smoothly to the ground as they step out of the sky.The gift pack includes a voucher for a 30 minute flight around York in a Gyrocopter. Also in the pack is a short promotional DVD which illustrates the excitement of flying in a Gyrocopter, together with a leaflet answering most of the basic questions people ask. Purchasing a gift pack gives you something to wrap up and give to the lucky recipient on their special day allowing them to see for themselves what they will experience. You book a date & time for the flight at your convenience. The Ultimate Gyrocopter Experience is a flying lesson in a Gyrocopter which lasts for around one and a half hours. Before the flight there will be a short introduction to Gyrocopters and a safety briefing. The trainee pilot will have the opportunity to have all their questions answered and they will be given an introduction to how they fly. Both the briefing session and flight will be done one-to-one with a Flying Instructor. During their flight, our trainee pilots will have the opportunity to take the controls and learn the basics of flying this exciting aircraft. The Gyrocopter is dual controlled and the Instructor will be able to take control at any time. For the experience itself there are 3 options - you have plenty of time to decide which option you prefer as you make the selection when booking the date and time for the flight. Option A Fly to Scarborough, over the cliffs and down to Filey beach. Then fly along to Bridlington and down to the sandy beaches. Flying just a few feet above the water - it`s brill! Option B Re-enact the Dambusters run. Fly low level over the water and hop over the Nidd dams. Fly fast and low level a few feet over the moors - superb! Option C Fly over the Humber Bridge and low level back along the edge of the Humber River. A truly fantastic experience!Some people prefer to concentrate on learning to fly the Gyrocopter whilst others prefer to use their first flight to enjoy the scenery and experience the sheer exhilaration of Gyrocopter flying.? The gift pack includes a voucher for a 90 minute flight in a Gyrocopter.? Also in the pack is a short promotional DVD which illustrates the excitement of flying in a Gyrocopter, together with a leaflet answering most of the basic questions people ask and details of the various locations where the vouchers can be redeemed. Purchasing a gift pack gives you something to wrap up and give to the lucky recipient on their special day allowing them to see for themselves what they will experience. You select the Ultimate option and book your date & time at your convenience.